Check back next month for information about our June webinar. Presenters will be announced one month before each webinar. To receive information about upcoming webinars, please sign up for the Religious Freedom Center’s e-newsletter. 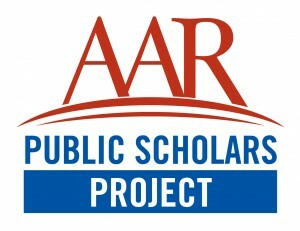 In the following online and onsite programs of the Public Scholars Project, participants will receive media literacy training, designed to help them hone their skills at communicating with a variety of publics (e.g., fellow residents, the electorate, public officials, journalists) in a variety of settings (e.g., social media, news, public events, community gatherings). Modes of public engagement may include, but is not limited to, effective use of Social Media (e.g., Facebook, Twitter, blogs, LinkedIn) and Video & Audio (e.g., YouTube, podcasting), as well as engagement with Journalists (interviewing techniques for print, radio, television; writing op-eds and letters to the editor) and Community Groups (public officials and educational, civic, business, and religious groups). The following programs are designed to help AAR members cultivate their media literacy. Participants in the Public Scholars Project also have the opportunity to engage in rigorous, graduate-level training to cultivate their civic literacy. The purpose is to prepare AAR members to become experts about the civic and legal principles that guide the relationship of religion and government, define protections for the free exercise of religion, and provide a civic framework for living among people of all religions and none. Unfortunately, many scholars of religion receive little or no civic education about the history and significance of constitutional and human right protections to freedom of religion or belief. As a result, scholars can mislead the public about the constitutional role of religion in public life, contribute to confusion about the meaning of church-state separation, and fuel misperceptions about the limits of free exercise of religion. To address this gap in preparation for civic and religious leadership, the Religious Freedom Center is currently partnering with the American Academy of Religion to forge a shared understanding of the place of religion in public life and work together to sustain America’s bold experiment in living with our deepest differences. This advanced training program is designed to equip scholars of religion to more effectively communicate in the public square about issues of religion and public life, and thus to foster broader religious and legal literacy. Marion Pierre serves as the AAR staff liaison. The project leads for the Public Scholars Project are Erik Owens, director of the international studies program and associate professor of the practice in theology at Boston College, and Ben Marcus, religious literacy specialist at the Religious Freedom Center of the Freedom Forum Institute.